A quick-hitter today as I’m out of town for a wedding. Splendid tales of vice to follow. Hair of the Dog calls this a “golden special ale” but every one else classifies it as a barley wine and indeed it smells and tastes just like a good one. No, a great one. Immediate smell of apple cider upon my pour. First taste floored me. Right up my alley. Just how I like a beer. Incredibly strong and incredibly potent. Almost like straight booze. Flavors of Belgian candy and extreme hops with tons of yeast sediment. Would love to taste this one aged. A tad too astringent of finish and, whoa boy, glad I only had a 12 ouncer because I think a bomber would have Belushied me. It’s not completely balanced either. These are minor quibbles though. This is probably the second best barley wine I’ve ever had after Stone Old Guardian. A beaut. 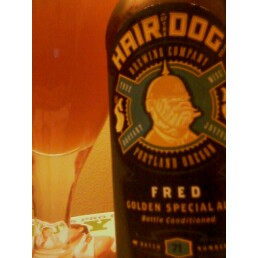 You are currently browsing the archives for the Brewer: Hair of the Dog category.